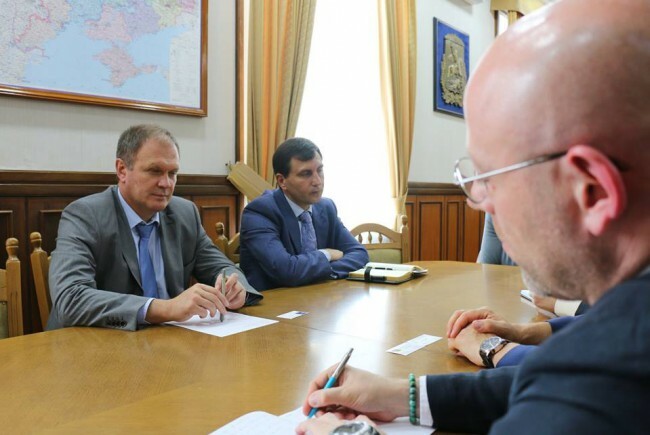 A European Union Advisory Mission Ukraine (EUAM Ukraine) delegation met on 15 July with Kyiv Oblasts Governor, Volodymyr Mykolajovych Shandra. Hugues Fantou, Acting Head of Mission, and Marcus Rolofs, Regional Outreach Officer, presented the Mission`s mandate and highlighted potential areas of cooperation. Governor Shandra expressed his specific interest in reforming police stations within the Kyiv Oblast and agreed to work together with EUAM experts towards this goal. EUAM has already successfully piloted such a project in Lviv Oblast at Sambir, which could be adapted to the needs of Kyiv and elsewhere.